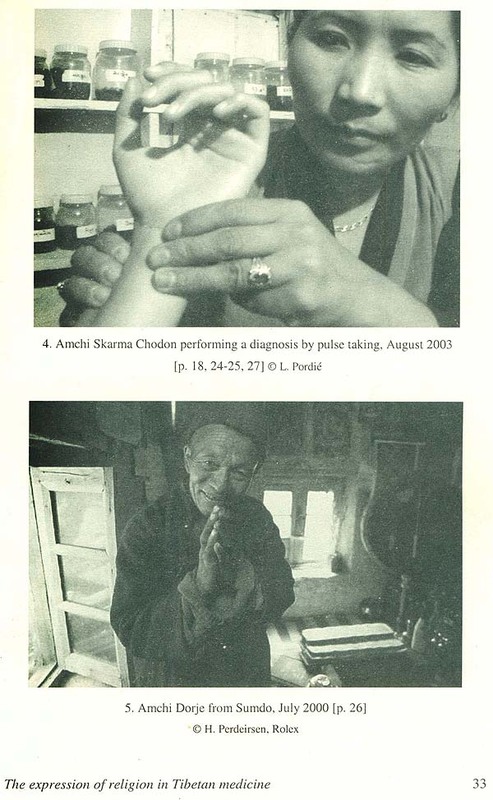 The medicine of the amchi (am chi) is the most used health care resource in rural Ladakh, an Indian region in the north-western Himalayas. 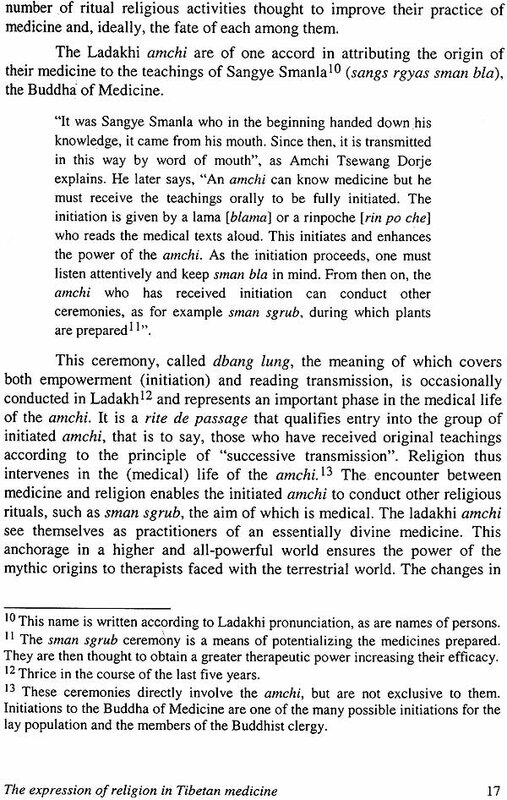 This medical system originated in Tibet (gso ba rig pa, the science of healing) and, according to the amchi, would have been progressively introduced into Ladakh around the tenth century C.E. The exact period is not known, but it seems to correspond to the introduction of the Mahayana form of Buddhism (Sanskrit: the great vehicle). This medical practice belongs to the scholastic medicines and is based on the fundamental Tibetan medical works, the basic text of which is the Rgyud-bzhi. Tibetan medicine is found in the Tibeto Mongolian communities distributed from west to east along the Himalayan chain, as well as in Mongolia and certain areas of Central Asia. This medical practice developed in China as far as Hong Kong and Beijing and has been transmitted with a certain success to the West and, to a less extent, Japan. It is also found in places of the Tibetan diaspora. 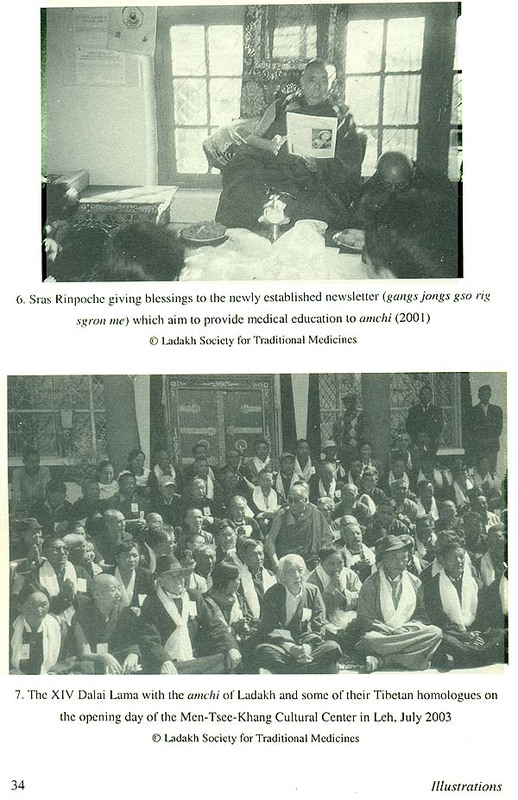 Tibetan medicine must be presented in its plurality, for all of the geographical locations and their histories, along with contemporary health policies and their various social issues have shaped the "original" medicine. The medical practices and techniques are not necessari ly identical and correspond to complex schemata involving the global level, such as ideologies relating to modernity and the international market for natural medicines, as well as the local level (modality of instruction, institutionalization, political conjunctures, integration with biomedicine, etc.). The economic, political, cultural and social issues of both the practitioners and their institutions respond to varied contexts and over the course of time allow different medicines to emerge, socially and, to a certain extent, medically. Without presenting in detail the reasons forming and transforming Tibetan medicine, we understand that to some extent there are in fact Tibetan medicines. The generic term "Tibetan medicine" tends to give the impression of homogeneousness to what in fact remains, anthropologically speaking, profoundly heterogeneous. In Ladakh, the terminology chosen by the amchi to present this medicine to non-Ladakh is exemplifies this point. They speak of "amchi medicine", an appellation which I retain in this text.3 This designation reveals in particular the local determination to consolidate a position within the Tibetan medicines and in the identity issues of the Ladakhi amchi community confronted as they are by the community of Tibetan amchi exiled in India and by local interests aimed at their legitimating within the Indian Systems of Medicine. 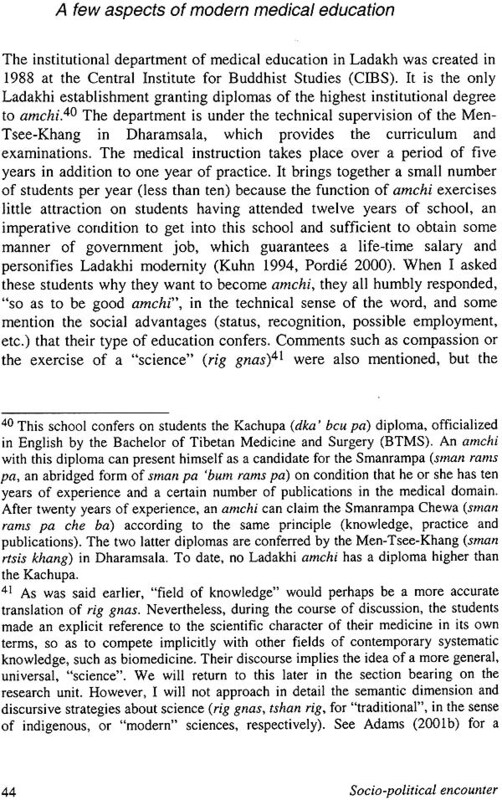 Ladakhiness is expressed through amchi medicine and gives it a singular character among the Tibetan medicines. These local "specificities" are to be observed on many levels, and particularly in the expression of the religion by the amchi. Contemporary studies on the Tibet Autonomous Region in China show that the religious practices traditionally surrounding medicine are diminishing, or indeed disappearing (cf. Janes 1995, 1999b; Adams 1999, 2001). The main reasons mentioned by these authors are the Cultural Revolution and the consequent oppression of religion by the Chinese government, as well as the biomedicalization of Tibetan medicine, which is one of the pragmatic aspects of socialist ideology. 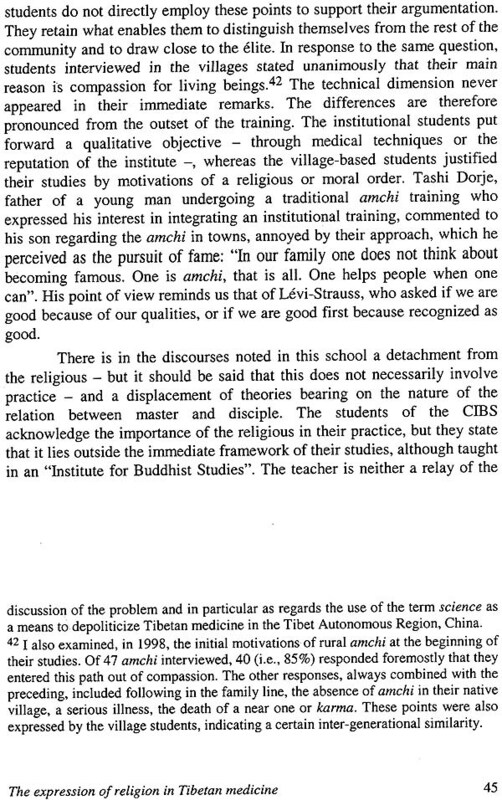 One observes with Janes the emergence of a narrow Tibetan herbalism, which is possibly taking the place of a more complete Tibetan medicine (1995). The social and political mutations in China and their ambivalent nature have not surprisingly influenced medicine, both in its organizational structure and its daily practice. This paper explores certain characteristics of the relations the Ladakhi amchi have with religion in order to provide elements for comparison with the operative logics animating the Tibetan-medicine-of- Tibet. 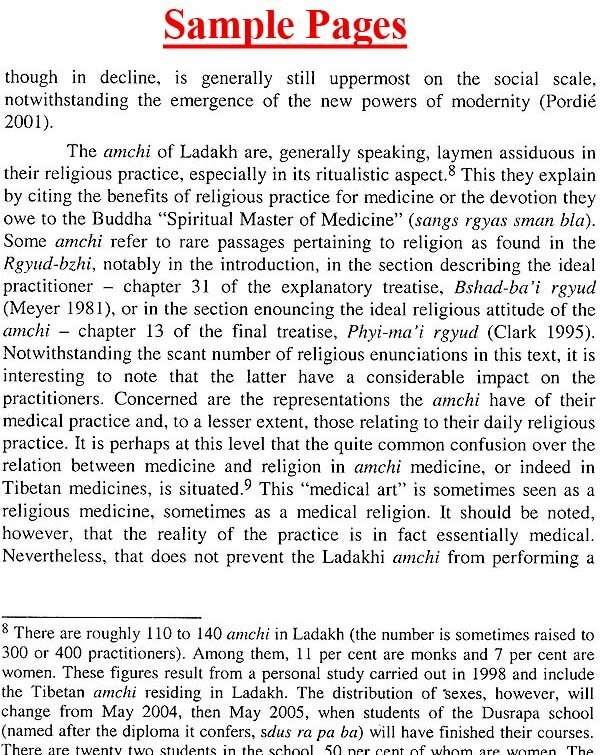 In Ladakh, the practice of the amchi is affected neither by religious oppression nor by a biomedicalization imposed by the state. There are, however, inter-religious tensions in this region between Buddhist and Muslim communities (particularly Kashmiri), and there is a certain biomedical development on the level of health and the emergence of a biomedical ideology (Pordie 2002), although an integration/confrontation of medicines is not formally planned. The question, therefore, is to know what 4 I use the phrase "expression of religion" to refer to various aspects of the manifestation of religion among amchi that I will consider in this text: discourses on religion, religious and ritual practices and socio-political use of religion. The Chinese government did not play the devastating role in respect to Tibetan medicine commonly attributed to it. 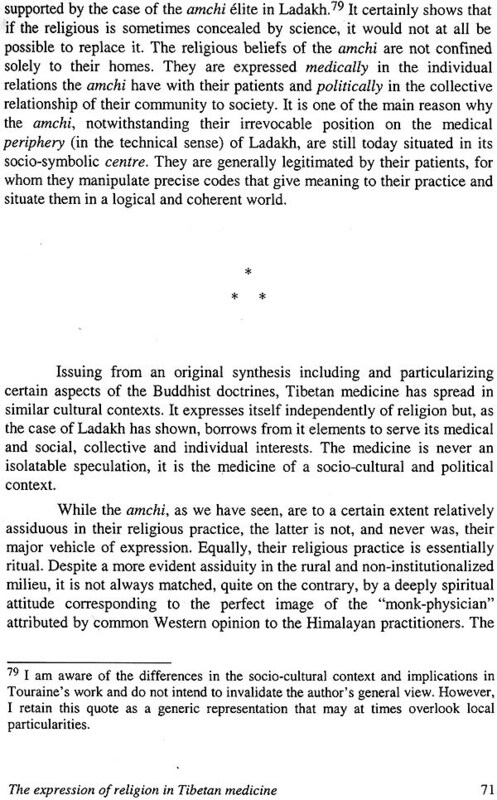 This ambivalence stems from the fact that government policies have certainly oppressed Tibetan medicine because it represents a clear expression of Tibetan ethnic identity, but they have also supported it by integrating it in socialist modernity (local recourse, complementarily with biomedicine, supposed affinity to Chinese civilization, etc.). The Chinese government has largely contributed to the transformation of Tibetan medicine according to this selective principle (cf. Janes 1995, 1999b). 6 The research was mainly conducted between 1998 and 2002, although more recent data are also included, and was focused on both the rural and urban amchi communities of Ladakh. place religion assumes in the life of the amchi. The first part of this paper presents the discourse of the amchi on the role of Buddhism in their medical practice and considers their religious practice when it is directly applied to medicine. 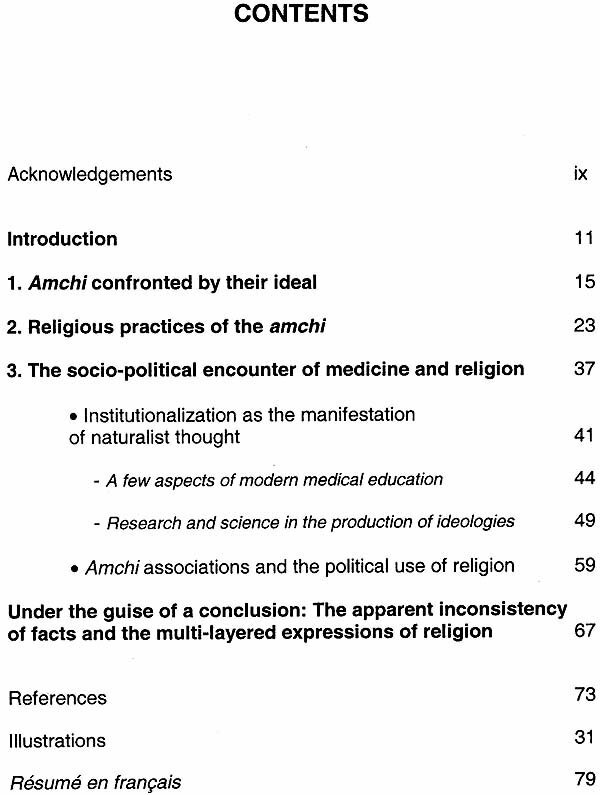 The amchi representations thus serve as markers to construct the religious frame putatively surrounding medicine. 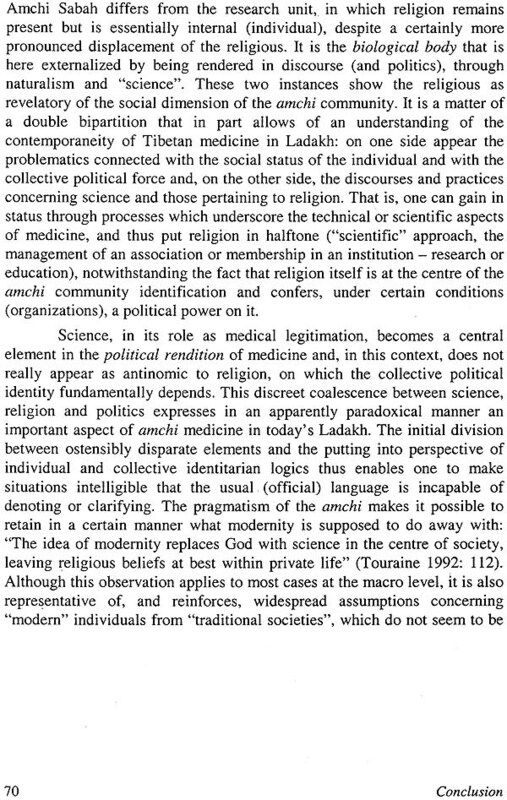 This approach then leads us to consider the contemporary urban combinations of religion and medicine, singling out two vantages of observation: institutionalization and the voluntary sector (in the case of a non-governmental organization). 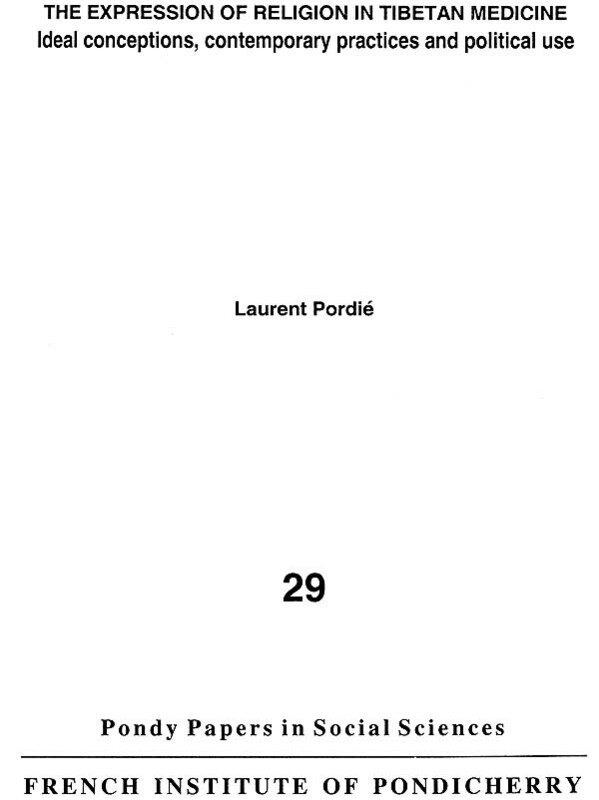 This in turn makes it possible to provide certain analytical keys to the understanding of more extensive regional phenomena concerning the expression of religion in Ladakh. Briefly, this chapter answers the following questions: What role does the institutionalization of Tibetan medicine play in the balance between a cultural health practice and a medicine which tends to become "universal" (scientific)? How do practitioners' associations mobilize religion to non-medical ends? And, what are the issues and modalities in the religious expression today?